Do you know of a local business that deserves recognition for efforts to create a greener planet? Is there a person you admire for unwavering dedication to producing a sustainable Wood River Valley community? 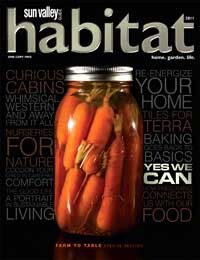 Habitat magazine wants to hear from you. This year sees the launch of the first Sustain It Awards, planned as an annual accolade to highlight the efforts within the local community to keep this a perfect place for future generations. The awards consist of five categories: Favorite Green Advocate (person or business), Favorite Locally Made Product (nonedible or edible), Favorite Green Restaurant, Favorite Green Business and Favorite Green Service. The Sustain It Awards will be voted on by the community, making this a true honor for the winners. The voting process is open now. Go to www.sunvalleyguide.com/habitat/sustainit and fill in the names of the people/businesses you think most deserve recognition in each category. Voting closes Sunday, Feb. 5, at 5 p.m. In addition, Habitat, the sister publication of Sun Valley Guide magazine, is seeking feedback from the community on changes people in the Wood River Valley have made to their daily lives to lead a more sustainable lifestyle. There is a section on the Sustain It Awards voting page for sending this information to the magazine.